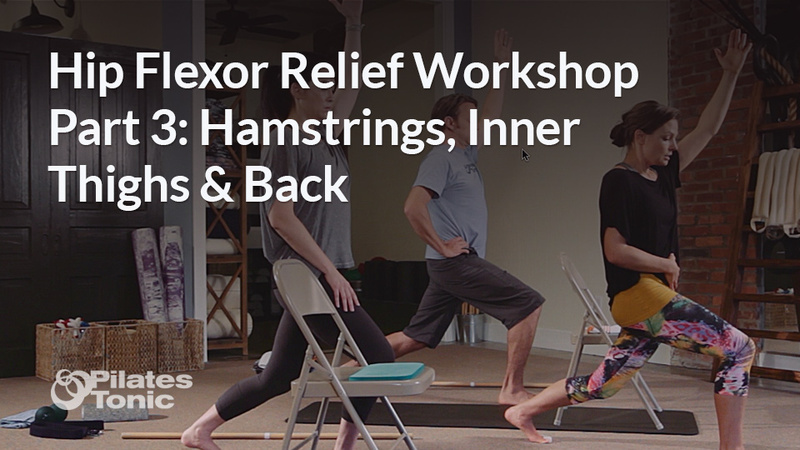 In this third and final segment of the Hip Flexor Relief mini workshop, you’ll find a combination and blend of exercises inspired by Fascial Fitness™, Kit Laughlin, Katy Bowman and Marie José Blom. While the theme of this course is the hip flexors, my goal with every workshop is to give you a blend of exercises that’ll help you feel better in your body overall. The workshop is divided into three segments you can play individually to target an area, or one after another to enjoy an entire class. Part one focuses on the hip flexor and quads. Part two focuses on the posterior hips and calves. Part three (this page) focuses on the hamstrings, inner thighs, back and also demonstrates a standing hip flexor stretch. If you live near Chattanooga, TN and would like some help customizing a strength, flexibility and body alignment program just for you, sign up for our Studio Foundation session, or give us a call at 423.702.5233 to easily schedule your first session. You can find us at 401 North Market Street, Suite B. If you follow along with any of the segments, or give the whole class a try, I’d love to hear how it goes in the comments below. This really helped my right hips, thank you so much for providing this to the public!! Thanks for your feedback Jessica! I’m thrilled to hear it was helpful for you! You really made it so easy. Gentle perseverance is the mantra. No haste as you gently showed. Yes! Thank you for your feedback! ? I’ve been doing this a few times a week for a few months now and have found it tremendously helpful. Thank you! That’s great to hear Carrie! I’m thrilled this series has continued to be beneficial! Thank you for sharing!